Niksic, Montenegro – His Eminence Metropolitan Christopher of Midwestern America officiated at the Divine Liturgy at the St. Vasilije of Ostrog Cathedral Church in Niksic on the feast of Pentecost, assisted by the cathedral clergy. The large number of faithful that attended the holy service received the blessings of His Eminence who, in his homily, stated that it is the faithful who with their souls, filled with the Holy Spirit, represent the adornment of Christ’s Holy Church. “Today is a beautiful feast and you, who accepted the Cross and Orthodox faith, confessing it with your life, you are the adornment of the Holy Church of Christ. For, if this beautiful Holy Church in which the Holy Service is served and is kept beautiful with the beautiful singing of your choir, then the Lord has also adorned your souls to be beautiful just as this church,” said His Eminence Metropolitan Christopher. He expressed his gratitude to His Grace Bishop Joanikije of Budim and Niksic for his hospitality and the honor bestowed to him that on the feast of Pentecost he might serve in the cathedral church in Niksic, where he joyously serves each time he visits Grahova, the birthplace of his parents. 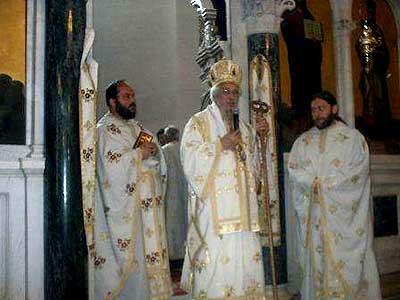 “I am here on a private visit to my family after the Holy Hierarchical Assembly of Bishops, held in Belgrade. Viewing it from a broader sense, all of you are ours just as we are all each others. As the children of God we need to always do that which is the most important and most needful that our descendants be drawn to Christ, that the Holy Spirit might dwell in them, for, for future generations, this is the best guaranty that they will be carriers of the Holy Spirit, to the joy of their parents and ancestors” were the word of the metropolitan who said that it gave him special joy to see that the faithful people of Montenegro are returning to their Church and that more and more of the faithful are attending the services. He expressed his hope that the purity of the Orthodox faith will be preserved in Montenegro and, in that sense, he spoke on the significance of religious education for children, the youth and future generations, that the Church not be destroyed by any sort of harmful influences which come from all sides.